Industrial optical fiber is also known as industrial fiber optic Ethernet switch, which is used in industrial control field of fiber switch equipment, due to the use of network standards, its open good, wide range of applications and low prices, the use of transparent and unified TCP / IP protocol, Ethernet has become the main communication standard in the field of industrial control. 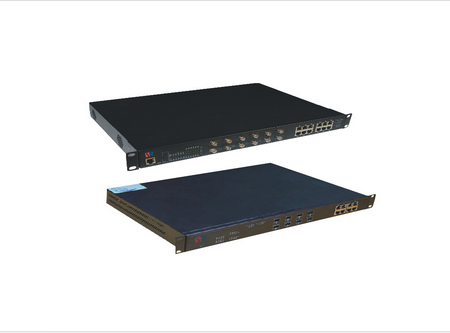 Industrial grade fiber optic switches are generally designed to meet: industrial wide temperature design, 4 electromagnetic compatibility design, redundant AC / DC power input. Another PCB board generally do "three anti" treatment. Industrial Ethernet switches and commercial switches in the data exchange function is basically the same, but in the design and the selection of components, the product strength and applicability to meet the needs of the industrial site. In addition, the expansion of the module is also more flexible than the commercial switch: a variety of optical ports and electrical ports available for matching. In the selection of materials, product strength, applicability and real-time, interoperability, reliability, anti-jamming and intrinsically safe and other aspects to meet the needs of industrial sites. Why the industrial site to choose the appropriate industrial Ethernet switches, and can not use cheap network switches to replace? We can from the following aspects to determine the industrial site in the choice of industrial Ethernet switch the need for. In industrial control systems, real-time can be defined as the responsiveness of the system's response time to an event. That is, after an event occurs, the system must reflect in a time that can be accurately foreseen. However, the real-time transmission of data in the industry requires very strict requirements, and data updates are often completed in tens of ms. And because of the existence of Ethernet CSMA / CD mechanism, when the conflict occurs, you have to re-send data, you can try up to 16 times. It is clear that this mechanism for conflict resolution is at the expense of time. And even a drop line, even if only a few seconds of time, it is possible to cause the entire production to stop even the equipment, personal safety accident. Because Ethernet at the beginning of the design, not from the industrial network applications. When it is applied to industrial sites, in the face of harsh conditions, serious inter-line interference, which will inevitably lead to its reliability reduction. In industrial environments, industrial networks must have better reliability, recoverability, and maintainability. That is, to ensure that any component of a network system failure, will not lead to applications, operating systems, and even the collapse of the network system and paralysis. Since the MAC layer protocol of Ethernet is CSMA / CD, this protocol makes the conflict on the network, especially when the network load is too large. For an industrial network, if there is a large number of conflicts, it is necessary to re-send data, making the network communication greatly increased the uncertainty. In the industrial control network from one place to another in the uncertainty, will inevitably bring about reduced system control performance. Industrial Ethernet switches in the design of the time to take into account the complexity of the industrial scene, which can more adapt to the industrial environment and play the role of the switch. Industrial Ethernet switches and the difference between the general switch is mainly reflected in the function and performance. Functional differences mainly refers to: industrial Ethernet switches in function with the industrial network communication closer, such as interoperability with a variety of field bus interconnection, equipment redundancy and real-time equipment, etc . ; and performance differences are mainly reflected In adapting to different environmental parameters. In addition to the industrial environment, there are many such as coal mines, ships and other particularly harsh environment, there are EMI (electromagnetic compatibility), temperature, humidity and dust and other aspects of the special requirements of the environment. The effect of temperature on industrial network equipment is the most extensive. This paper mainly discusses the influence of this important parameter of temperature on the industrial network switch. And for the functional aspects of performance and other aspects of the parameters are not repeated here. Reliability refers to the ability of the product to complete the specified function within the specified conditions and within the specified time. Any product, whether mechanical, electronic, or mechanical and electrical integration products have a certain degree of reliability, product reliability and experiment, design and product maintenance has a great relationship. 3. Failure rate λ (t), refers to the product under the conditions of use in the use of time t after the product failure probability. Product reliability changes generally have a certain law, the characteristics of the shape of the curve like a bathtub, commonly known as the "bathtub curve." In the early stage of experiment and design, because of product design and manufacturing errors, software is not perfect and the lack of components and other reasons caused by the early failure rate is high; by modifying the design, improve the process, aging components, and machine testing, Into the stability of the accidental expiration period; the use of the general time, due to device wear, machine aging and maintenance and other reasons, the product into the loss of failure period. This is the reason why the reliability curve is "bathtub curve" type. Measuring an electronic product, especially the most commonly used industrial products is MTBF, which is the average time between failures. As the density of electronic components used in modern electronic devices is increasing, this will result in thermal coupling between the components through conduction, radiation and convection. Therefore, thermal stress has become one of the most important factors affecting the failure rate of electronic components. For some circuits, reliability is almost entirely dependent on the thermal environment. Therefore, in order to achieve the desired reliability objectives, the temperature of the components must be reduced to a practically achievable minimum level. Data show that: the ambient temperature for each increase of 10 ℃, component life is reduced by about 1 / This is the famous "10 ℃ law". 1. If you do not use any cooling measures, a 24-port switch (without optical port) work for 4 hours, its machine temperature than the ambient temperature of about 40 ℃ higher than the use of fan cooling the same switch The temperature inside the machine is only about 15 ° C higher than the ambient temperature. 2. When the temperature reaches 85 ℃, the temperature has already begun to affect the life of many chip devices in the machine board. That is to say, if the heat dissipation is not adopted, when the external temperature is 45 ~ 50 ℃, MTBF will drop significantly. Thus, the impact of temperature on industrial network products is very large, if the same as the use of commercial switches fan cooling, can effectively reduce the machine temperature and extend the MTBF equipment, but the fan itself life is very limited (2.8 years) Data given by SANYOFANDATASHEET). Industrial equipment is different from commercial equipment, often a boot on the perennial run, and the operating environment is often worse, dust, insects, moisture will directly affect the operation of the fan. A good quality of the switch, the fan life is generally 20000 hours, the fan to the years later, the detection and replacement becomes very important. Because the active heat dissipation switch in the design of the heat is mainly by the fan cooling, once the fan failure and not replaced in time, "10 ℃ law" will work: the machine ambient temperature for each increase of 10 ℃, component life is reduced by 1/2 The The switchboard heat build-up will quickly lead to a decline in switch performance until the switch crashes. Therefore, the industrial switch cooling system design, that is, thermal design is particularly important. In summary, due to the specificity of the environment in which the industrial grade optical switch is located and the particularity of the environment (not to stop), the countermeasures used in dealing with high and low temperature, mainly high temperature environment, are different from those of ordinary switches. (1) for lower power conditions, the general P ≤ 10W, try not to use fan cooling, and the use of natural heat, if through natural convection, or increase the shell area, shell fold, or use better thermal conductivity profiles, such as aluminum Wait. (2) for the larger power, P ≥ 15W, especially when there are multiple optical ports, or even multiple single-mode optical port, can not rely on natural cooling to solve the problem, you should use the active cooling method to solve the heat problem The The active cooling mode is mainly refers to the installation of fans, but because the industrial network equipment can not stop and the long-term operation of the particularity of the use of the fan should be considered as follows. ① fan is different from the ordinary electronic equipment fan, it should be intelligent, intelligent fan in the life and function and the ordinary fan of the qualitative difference. ② intelligent fan should be designed for hot plug, that is, in the case of non-stop system, if the intelligent fan system alarm (working life expires, etc.) circumstances, you can replace the fan online. Take the above thermal design and cooling measures, you can greatly improve the network equipment MTBF, to extend its life, so as to avoid the rules, so that industrial network equipment components long-term work in a "stable, comfortable" temperature environment, 10 ℃ law "does not work, which also ensures the automation process of communication system stability and reliability. Summary: Industrial fiber switches have carrier-class performance characteristics, can withstand the harsh working environment. Product range, flexible port configuration, to meet the needs of a variety of industrial applications. Products with wide temperature design, protection level of not less than IP30, support for standard and private ring network redundancy protocol. Can be very good for coal mine safety, electricity, transportation and other work environment more stringent complex industries.